1. 3 pounds ham, cooked, cut julienne. 2. 1 1/2 pound celery, sliced fine diagonal. 3. 1 head iceberg lettuce, shredded. 5. 1/2 cup sweet relish. 8. 5 hard boiled eggs, chopped medium. 9. 1/4 cup parsley, chopped. 10. 25 leaves, romaine lettuce. 1. Place the julienne ham, celery and shredded lettuce in a mixing container. Toss gently. 2. Add the sweet relish and mayonnaise. Toss gently a second time and season with salt. 3. Line the cold salad plates with a leaf of romaine lettuce. 4. 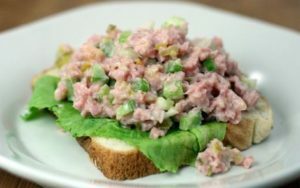 Place a mound of ham salad in the center of each plate, top with additional mayonnaise, chopped parsley and chopped eggs. 5. Garnish with 2 wedges of tomato and serve.